Liqui-Lawn will control lawn damaging insects on an as needed basis. A broad spectrum insecticide controls the most common turf insects in our Colorado lawns. Insect activity usually occurs in the spring with browning or thinning patches that don’t green up or brown out after initial spring growth (see image below). Flocks of black birds or starlings feeding on the lawn in the early morning may indicate insect activity. Small peck holes in the turf may be observed where birds may have been feeding. Growing a healthy lawn helps the turf better tolerate insect activity. 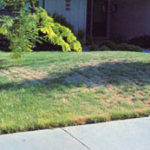 Remember a properly mowed, fertilized and watered turf develops a deeper root system. A healthy lawn will better withstand insect activity, suffer less damage and recover more quickly.